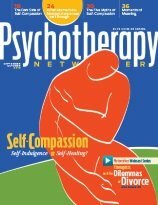 Over the course of their careers, most psychotherapists discover that to be genuinely helpful they must learn to do something more than simply wield a set of highly specialized professional skills. But what exactly is this “something” that’s both the bedrock of therapy and the energy that propels it forward? After the unrest in Ferguson and Baltimore, the Emotional Emancipation movement offers a different way to address racial issues in the African American community. Too often both clinicians and clients fall into the trap of pursuing weight loss as a therapeutic goal. Life after Trauma: What are the possibilities for post-traumatic growth? The new emphasis on the transformative power of trauma can be a template for false assumptions about the “gift” of suffering and the meaning of recovery.